Rated 5 out of 5 by Psalm18_2 from ENJOY I loved playing this game. Wished there were more like this game. Only thing was I didn't care for the story line. Rated 5 out of 5 by tjcj from Good Match 3 I really enjoyed this game. The only thing I can say that I didn't like is that I zipped through the levels so fast and it was over. I would have liked more levels. Rated 5 out of 5 by pegasuspam from Fun and relaxing M3 game I just finished the trial and then bought it. It's a fun and relaxing game and it's fun shooting at the bat,turtle and spider. I like the idea of having HO's also. The music is not annoying,gameplay is fun with help from a tile buster using it only when you need it. I tried it because I like M3 games, but a lot of them are all the same and I get bored after awhile. You have to at least try the trial version. I'm going back to play now. Happy Gaming! 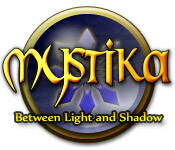 Rated 5 out of 5 by SassyBoots from Mystika: Between Light and Shadow comes Twilight I thoroughly enjoyed this game, even though it is a tad frustrating. Match 3 with a touch of Hidden object (the graphics need a little bit of help). What more could I want? My favorite combo!! It is fun and the story line is okay. I played to the end of the trial, but I purchased it immediately and played on to the end. It held my interest to the end. I haven't looked at the other reviews because I don't want to slant my opinion. Ha-ha.....as if. Much better than all this dark, mystical magic. You could at least have some fun, mystical magic once in a while. I have hundreds of your games, but many lose their appeal before the trial is finished. Some are too cryptic--not this one. It's great. Rated 5 out of 5 by tailswhiskers from Fun match 3 and hidden object game This is a match 3 and hidden object game. So far there is only one hidden object part of the game. After you do so many breaking chains, you win a trophy. You can win different types of trophies for doing different things. I found it to be very relaxing. The time went very fast and before I knew it the time was up. I like this type of game because it mixes up to types of games. Match 3 and hidden object. Rated 5 out of 5 by caseymom from A Nice Little Game This game is a typical match three with a few fun items thrown in...a bat, a spider and a turtle so far. I played the hour demo and then bought it. It has no tech issues and hint button recharges quickly, the music isn't irritating, and the only thing I didn't like was from level to level, you have to wait for the little arrow to move to the little dot and turn green. Then you can hit play. It is also easy to get out of...just hit save and exit and youre gone. I also hated to kill a turtle...didn't mind the spider or bat. There is a HO scene in each of the six locations to earn another magical power. Pretty hard HO's but really liked this game . It is a nice change from time management. Rated 5 out of 5 by FloridaGirl7264 from Fabulous! This game is a little bit more than your average M3. There are a few HOS. There are also bats, spiders and turtles that try to stop you from clearing the board. All-in-all a fun game! Rated 5 out of 5 by feanas from Darling Little M3 I have been waiting for a nice M3 to come along and it has, yay. This is a cute M3. 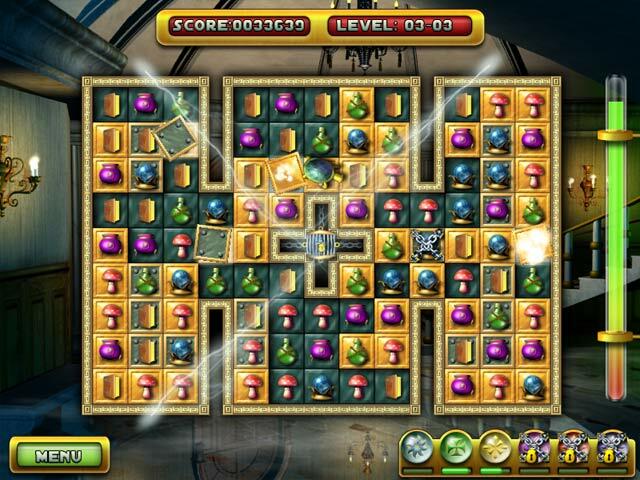 Rated 5 out of 5 by SrRat from Fun Match3 Game The look of this game is really nice, very rich and colorful. Very easy to play with the tiles sliding quickly. You can make matches while prior matches are exploding. There are also critters, like bats, turtles and spiders, that show up and undo your work. There are Hidden Object screens, one on each level I believe. I found the objects very hard to find. They are not the predominent play, so I don't consider them a big negative. Rated 4 out of 5 by tutortime from Liked it. This was a good solid game. Easy to complete and the music was relaxing. However, a little repetitious in the match 3 scenes so the 4 star rating. I like to keep this type of game open on my desktop to play in-between my other games. Rated 4 out of 5 by Clavister from good mix between M3 and HOG It is a good mixture of M3 and HOG. I would have preferred it as a pure M3. But it plays well and make fun. Rated 4 out of 5 by PenPenB from Fun Game It's a fun game, good graphics. Rated 4 out of 5 by pmanuel from Fun Match 3 Good fun and challenge, can easily play this many times and still have a good time. Rated 4 out of 5 by mdpac11 from Match 3 & hidden object game I enjoy match 3 games and I also enjoy hidden object games. With this game I was able to combine my likes in one game. Rated 4 out of 5 by kdubs from Liked it alot, especially after getting further into it. I was so irritated by those pesky pests that keep popping up and wreaking havoc with my boards that I almost didn't buy this. But when BigFish threw me out at the end of my hour, only then did I realize that I actually was enjoying the game, despite the pests. :) Each pest actually has their own particular brand of nasty which they crawl around and plant on your boards. So the sooner you whack them or the sooner you make matches under them, the more quickly you can clear the board. Since they continue to plant chains, metal blocks, and gold squares, getting rid of them quickly is part of a winning strategy. Do I think it unnecessarily complicated things from a fast/repetitive click point of view? Yes!! That fast/repetitive clicking can really hurt! It was almost enough to keep me from buying, but once I read in the forums that making matches under the pests got rid of them too, it helped. The powerups are gradually unveiled and most are actually pretty helpful. They seem to charge a bit slowly at the beginning of each board, but re-charge much more quickly. It's Chapter 5 before you get the powerup to "kill all monsters". There is 1 Hidden Object scene for each of the 6 chapters. Some tiny items and dark/indistinct items, but hints are available. There is a fairly basic awards system. 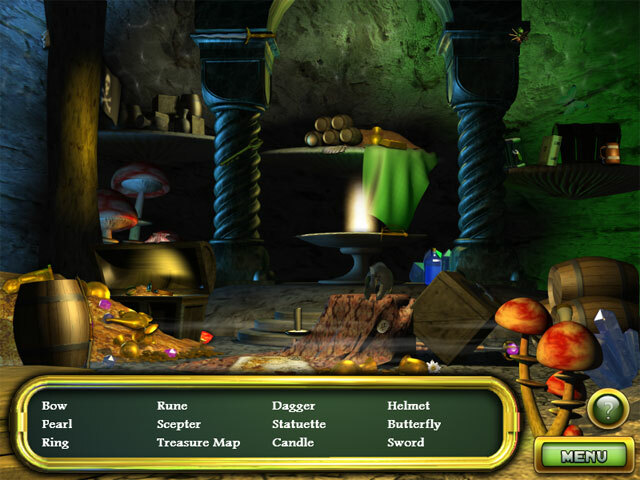 There are approximately 65 levels spanning the 6 chapters. After completing the first round, I got the message "Congratulations, Expert Mode is Unlocked". I started Expert mode this morning -- all I notice so far is that the pests seem to be come more quickly and they are more prolific doing their pesky board changes. Rated 4 out of 5 by Alee7383 from Nice Mix This was a good M3 game with HO thrown in. Graphics were nice and sharp and a little "shooting" thrown in as well. It kept your interest because how "different" can you make a M3 game, but it was a little different and it was enjoyable. I do not keep sound on especially music so I cannot rate the music, but the sound background was good and it was nice to here "excellent" when you took out 100 pcs. at once. All you M3 lovers will like this one! Rated 4 out of 5 by myyorkies1994 from A Cute, Less Challenging Game This match three is cute, colorful and great for the days when you don't want your greatest skill challenge, or fun for the young player. The timer is plentiful and as the levels increase the game board configurations become more elaborate. Your nemeses are bats, turtles and spiders who will reactivate cleared cells so you need to eliminate them as soon as they appear. 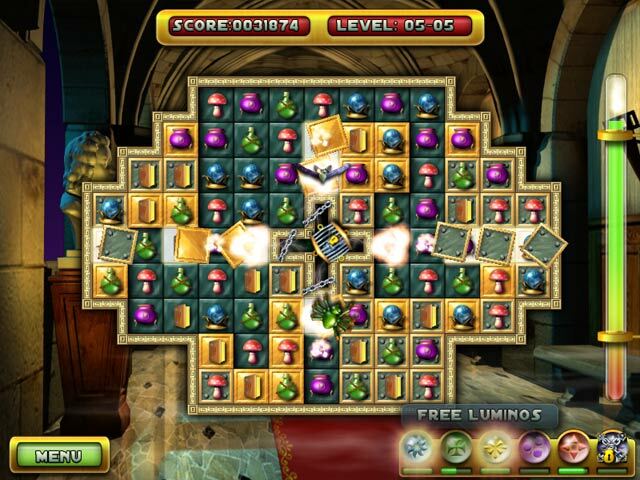 There are hidden object boards at the end of each level, where you earn new power ups. I didn't have to use any during the one hour trial. It's simple and enjoyable fun without requiring a lot of strategy. Rated 4 out of 5 by wrennie from A really nice match-3 This is one of the nicest match-3 games to come along in a while. The colors are great, the music is wonderful, there is a good storyline and I love the deterrents in the game. There are turtles, bats and spiders that get in your way that you must destroy. I got one power-up and it destroyed several tiles, not just one. The pictures on the tiles are nice and they fall well; the sounds are appealing and not obnoxious. Gameplay moves along swiftly you can comfortably achieve your goals within the timer limits. You can turn the timer off in options if you want. This is definitely worth the price. Rated 4 out of 5 by tacomataz from Good game From the beginning the graphics I found are good. I also thought that the little bats, turtle and spider that randomly show up were alot of fun. The objects in the HO parts of the game were hard to find but I was able to find them. Over all a fun game but it is not the best match 3 game. Rated 4 out of 5 by LPERM from Entertaining match 3 game (with a little HOG). I was glad to see a match 3 game for a change. To many HOGs this summer when I don't spend as much time in front of the computer. Was even more glad when I actually liked it. It even has some hidden scenes. Just the right difficulty for quick in and out play. Rated 4 out of 5 by Spookys_Mom from I Love Match 3's Let me begin with my title "I love Match 3's". My second favorite is hidden object so I get both with this game. As far as I can tell the HOs are few and far between. First for all the players who want untimed, there is an untimed mode but not sure if it is really needed. I got to the second part of the Quest in the hour demo and have not run out or come close to running out of time. Very smooth transfer of tiles and falling of tiles. You can make matches while tiles are falling. I haven't seen that in any of the new games for a while. If there is anything I hate it is having to click on a tile and then click on the tile where you want to switch. I will not buy any game that makes you do that! This is a definte buy for me. Although it is pretty easy I still enjoyed playing. I did find the bats, spiders and turtles that fly into the game annoying but they are killed very quickly and a good Match 3 comes along so rarely that I am going to overlook this flaw and BUY! Rated 4 out of 5 by berrygood from Fun M3 game and great for those new to M3. I played the entire demo and bought the game right away. It's deceptively simple at first, but becomes more difficult the more levels you play. The game boards become more varied and it takes longer to make all the matches. That said, it's not as complicated and difficult as some M3 games I play, but it's fun. I can see this being especially good for those who are just venturing into the M3 games. It's challenging, but not too hard. There is some variety, with a HOS every so often and some critters that invade the screen that you shoot for extra points. These, by the way, become faster as you play so they are a bit harder to shoot. The story is ok, but sort of superfluous. And the translation is a bit awkward, like it was written by someone for whom English is a second language. But in this game, you don't really need to story to have fun with it. It's an enjoyable way to pass a little time with some mild to moderate challenge. Rated 4 out of 5 by smilesmiley from Wanna pass the time away? This is a typical match 3 game but it has a few HO games just thrown in there. If you just wanna pass the time away, this is the game for you. If you want a game with more substance, find another. Rated 3 out of 5 by Pushalone from Tedious animals The bat, turtle and bug are extremely distracting, not difficult to be rid of and could use a turn them off button. Not necessary and detracts from the rather ok game. Rated 3 out of 5 by ooakPlayer from I wanted to give it 5 stars, but... My less-than-stellar rating belies the fact that I absolutely LOVE playing this game! It has many things going for it. For one thing, the music (very important to me): it's beautiful, melodic and haunting. Even though it is repetitive, I don't mind because it is eerily mesmerizing to me. And it goes with the action/"story" of the game. Also the sound effects are terrific, it sounds like you are slashing through the objects/tiles with a sword! I found this game challenging for a Match 3. There is a timer and in the beginning, I always seemed to get down to the wire with it and sometimes even had to re-do a level. But that's good, if I can get through every level easily, I won't find it challenging enough. And then there are the evil creatures (bats, spiders and turtles) that crawl in to wreak havoc on your work by re-chaining tiles. So between the Creatures and the Timer, I found plenty of challenge. There are "power-ups" that are incrementally made available to assist with these challenges. But they take a long time to power up and so you have to use them sparingly, again just adding to the challenge. Plus, once you go through all the levels, you can then play through again in "Expert Mode". I'm not sure if it's really any more difficult because by that time, I had really gotten the hang of the game and so I'm sure my experience made me a better player by that point. So it's hard to tell if Expert Mode is actually more difficult. My complaints about this game start with the graphics display. They are okay in the design and illustration sense, but when I play Mystika full-screen on my big beautiful 27-inch iMac, sadly the graphics are fuzzy. There is no way to select a higher resolution in the Options. So I play this game in a smaller window and it looks okay at that size. My second issue is with the "story". It could have been developed a little more. You never see anyone, [the sister, the dark queen or any people at all] and I just think that's kind of strange. You are periodically presented with a book, written in first-person by a young mage on a quest to master six ancient spells and free the Luminos, a unique source of magic and rescue it from the queen of the dark world. The book unfolds the story between levels which turns out to be not that interesting. And lastly, there are a number of Hidden Object challenges sprinkled in. Which I don't like. In this game, the objects are often obscured in the shadows. The art is very dark and I had to use a lot of Hints to figure out where some of these things were. I'm not a big fan of the Hidden Object genre, so these areas were rather lost on me, I just wanted to get past them so I could start swapping and slashing objects and tiles! I know they have come out with a second Mystika which I have demo'd... however, I found Mystika 2 to be too easy for me. Although in that version the interface graphics have been greatly upgraded, it lacks the eery dark feeling that this first one has. Which I like. Correction, love. I play it a lot. Love, love! It would have gotten 5 stars from me if it had better graphics display and story.